Here is the tumultuous, heartrending, true story of the Romanovs—at once an intimate portrait of Russia's last royal family and a gripping account of its undoing. Using captivating photos and compelling first person accounts, award-winning author Candace Fleming (Amelia Lost; The Lincolns) deftly maneuvers between the imperial family’s extravagant lives and the plight of Russia's poor masses, making this an utterly mesmerizing read as well as a perfect resource for meeting Common Core standards. Welcome to Bookish, Candance!​ I'm so excited to have you here with us today! I absolutely loved The Family Romanov and enjoyed the light it cast not only on the family, but what was happening with the rest of Russia at the same time. 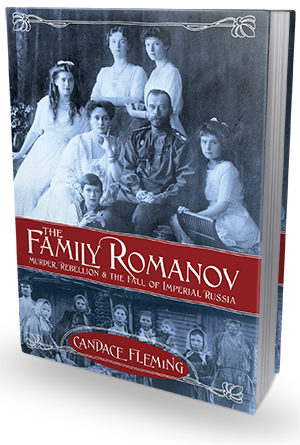 What was your initial inspiration to write The Family Romanov? In truth, I’d never considered writing about the Romanovs until about five years ago. That’s when students in middle schools – mostly girls -- suddenly and surprisingly started asking if I knew anything about Anastasia Romanov. Practically every time I visited a school, during the question-and-answer period of my presentation, a hand would wave wildly in the air. No matter that I’d come to talk about people from American history. Time and again I’d find myself talking about Tsar Nicholas’ youngest daughter. Why, I asked myself. Why the sudden interest in Anastasia? I eventually came to realize that these middle schoolers had seen the animated movie, Anastasia. They recognized that it was based on a nugget of truth. But what was that truth? They longed to know. And they hoped I could tell them. Sadly, in the little time allotted, I really couldn’t… not enough anyway. And so I began to conceive of a book for them. The Family Romanov: Murder, Rebellion And The Fall Of Imperial Russia, is my answer to those girls’ questions. Is it the royal fairy tale most of them imagined? Probably not, but it’s definitely the truth. And I believe that’s exactly what they wanted. This will probably sound strange, but everything was surprising when I first began researching. I felt like a child, awestruck and toddling through a brand new, unfamiliar world. My eyes were wide, and everything swirled around me. This, I realized, was how my reader was going to feel when he or she entered my book – a whole new place, unfamiliar, yet dazzling. I needed vivid, sensual details, well chosen and that spoke loudly for the people I was writing about. Experience has taught me that the panorama of details-- when pulled together and focused-- define a life. The essence of who that person was is revealed. That’s the difference between history that brings people from the past alive, and history that puts people in the present to sleep. I think of research as having two interwoven paths. The first is, of course, archival. What’s already been written and collected? I focused on direct sources – letters, diaries, memoirs, interviews. This is where defining, intimate details are found. For example, in an affidavit given to the members of the communist party, a former chambermaid discussed her work at the Romanov palace. Among her many tasks was the daily changing of the Empress Alexandra’s bed linen. Why? “[Alexandra] had a fondness for English biscuits which she consumed between the sheets while reading her books.” Ah! Crumbs in the bed! Now THAT’S a great detail. Another member of the staff – the children’s nurse – complained about Alexandra’s nasty dog, Eira, who hated everyone but the empress. “Eira slept at the foot of the bed and often received tastes of the Empress’ favored English biscuits.” Those cookies again. Details from two different sources – uncovered months apart -- that begin to build a tiny, yet intimate picture of Alexandra. It was a jigsaw puzzle, you see. I dug through jumbled mountains of documents – memories left behind by ladies in waiting, tutors and priests; generals and diplomats; factory workers, family members, cleaning women, politicians. Even the Romanov’s guards. Even their firing squad. The pieces of the puzzle began to fit together. A picture began to emerge. The second path is real-world research. For me, it’s imperative to visit the places where my story happened. Landscapes speak. Houses hold memories and secrets. So in August 2012 I traveled to Russia where I followed in the Romanov’s footsteps, visiting Rasputin’s apartment; exploring worker’s neighborhoods, Lenin’s headquarters and the dark, dank jail cells of the Peter and Paul Fortress. At Tsarskoe Selo – the family’s residence -- I wandered down shaded lands and through lush gardens. I didn’t just learn how the place looked. I discovered how fragrant the lilacs are after a rain shower; how the ornamental bridge creaks when you cross it; how cool and dark it is in the woods. No historical document could have given me that. None of my sources had mentioned how close the Alexander Palace sat to the front gate, either. I’d assumed it was somewhere in the middle of the Imperial Park, far from prying eyes. Not so. The tall, main gate with its golden, double headed eagle opens directly onto the palace’s circular driveway. Every day the family could look through its iron grillwork to the town just on the other side. It gave me pause. The family was so close to it’s people. They were right there, just on the other side of the gate. The Romanovs could look out their windows and see them. They could hear their people’s voices from the palace balcony. They could smell their cooking and their livestock. They really weren’t as physically removed from the people as sources led me to believe. So why, I wondered, didn’t the Romanovs feel more attachment to their subjects? The question led me down entirely new paths of thought. And it eventually led to the book’s inclusion of first hand worker and peasant accounts under the title, “Beyond the Palace Gates.” I had uncovered a detail that presented a new story line I’d never imagined. You see? Endless surprises – big and small. Do you have a favorite Romanov? If so, who is it and why? The torture falling to our shores. And Thy great meekness to achieve. That we may stand the bitter test. This hour of utmost dread to bear. In meekness for our foes to pray. If I could tell the world just one thing, it'd be stop worrying about your weight. The last book I bought was Severed: A History of Heads Lost and Heads Found by Frances Larson. Who can resist a book with this first line: “Josiah Wilkinson liked to take Oliver Cromwell’s head to breakfast parties.” Great, huh? The title of my autobiography would be Fish Tales, Farts And The Fountain Of Truth: A Life In (Offbeat) Stories. Thank you, Candace! I loved these answers and they definitely gave me a bit more insight into your book and your process in writing it. To be in your head when you're researching and writing these books - I can only imagine! If you haven't read it yet, check out my review of this fabulous book. It's definitely one you cannot miss!